A trio of chemists at Okayama University has published a paper in the journal Nature Catalysis outlining the manner in which sodium can be safely used for cross-coupling reactions. In their paper, Sobi Asako, Hirotaka Nakajima and Kazuhiko Takai describe relatively safe ways to produce organosodium molecules. 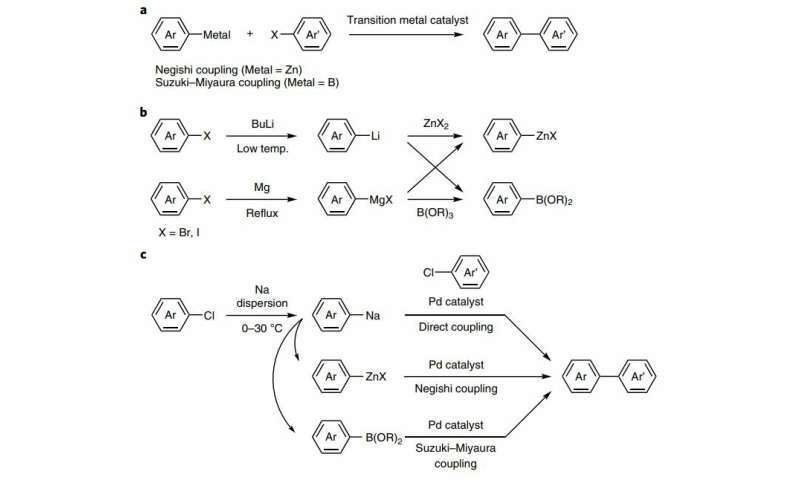 In chemistry, cross-coupling reactions join two organic compounds using a metal as a catalyst. One metal commonly used for such reactions is lithium, which is notably rare. Chemists know sodium is a possible catalyst, and is a far more common element—the researchers point out that it is the most abundant alkali metal in both the Earth's crust and in the ocean. But chemists also know that using sodium in such reactions is dangerous—the slightest mistake can result in a fire. A student at UCLA died from severe burns, for example, in 2008, when a syringe malfunction caused a fire. In their paper, Asako, Nakajima and Takai argue that there are safer ways to use sodium and outline a method. The researchers note that they began rethinking the idea of using sodium in cross-coupling reactions at the urging of a company that makes dispersions using sodium particles. They wanted to know it if might be possible to use sodium-in-paraffin oil as part of their work. The researchers thought it might be possible because some chemists have been converting aryl chlorides into arylsodiums through the use of sodium dispersions for many years. The researchers used a similar approach, creating arylsodiums under inert atmospheres and then using them right away to instigate other transformations. They report that doing so showed that arylsodiums could be created easily and relatively safely using aryl chlorides, which could then be used for cross-coupling reactions. They demonstrated the possibility by performing transmetallations to zinc and then using the result to carry out Negishi and Suzuki–Miyaura cross-couplings. The researchers acknowledge that the scope of applications is currently limited, but suggest there might be ways to overcome roadblocks. But they also suggest that other researchers might want to replicate their work as part of efforts to reduce the use of lithium in commercial applications. The fatal fire at UCLA was caused by t-butyllithium, not a sodium compound.